Say you're a geek, finally tying the knot with your beloved (who is also a geek). What could be better than having a nerdy wedding with a Portal and Revolutionary Girl Utena theme? This one goes under "Awwwwww" for the week: Data analyst Anli and her girlfriend Laura (a public servant) might not have been able to legally marry each other down in Australia, but it's the thought that counts, isn't it? And frankly, I don't think a ceremony like this one can be called anything but a wedding. Because our wedding was so small, we skipped having a dance floor and invited guests to games of Lupus In Tabula after dinner. 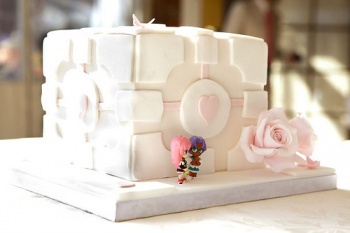 Our cake and bonbon were companion-cube shaped. We played Rock Band instead of having a Hens Night. And we walked down the aisle to an obscure piece of music from [Revolutionary Girl Utena]. Congrats to the happy couple, but I have just one question: If this was, in fact, a Revolutionary Girl Utena wedding, did one of them turn into a sports car and drive the other away from a repressive world of responsibility and tradition in a really trippy sequence of symbolism that nobody ever understands until it's explained to them? ...yeah, don't ask. You're probably better off not knowing.